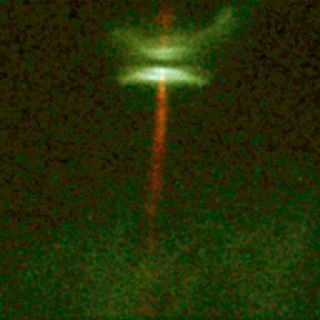 A reddish jet of gas emanates from the forming star HH-30, which is surrounded by a protoplanetary disk. The search for water on other planetary bodies has taken agiant leap forward in recent months. In November, NASA announced that it hadfound substantial quantities of water on the Moon. Earlier this month, theCassini spacecraft obtained data about one of Saturn's moons, Enceladus, that mayconfirm the presence of sub-surface liquid water. While these missions scour our solar system for tracesof water — a necessary condition for life — a group of scientists islooking beyond, at solar systems light years away. A recent study published inthe journal Astrobiology described using infrared spectroscopy to model thedust surrounding young extrasolar stars to try to detect the presence of hydrousminerals called phyllosilicates. One of the simplest examples of phyllosilicates is clayminerals. Water is an important part of their chemical structure. "If you find phyllosilicates, you have most likelyfound liquid water," says lead author Melissa Morris, a visiting professorin the Department of Physics, Astronomy and Materials Science at Missouri StateUniversity and an affiliate of Arizona State University's School of Earth andSpace Exploration. "The objective was to try to determine whether we couldactually detect these wonderful signatures of hydrated minerals almost alwaysproduced by the interaction of liquid water with rock." In order to determine whether the surface of an extrasolarplanet would contain water, scientists can look at what is called the protoplanetarydisk — a disk of gas and dust surrounding a star during its early stages ofdevelopment. Scientists think planets are born from protoplanetary disksthrough gravitational and electrostatic interactions between particles. So ifscientists can determine the elemental composition of the dusty disks thatorbit young stars, they should be able to predict what sort of planets will eventuallyform. The scientists hope to someday use instruments such asthe Spitzer Space Telescope and the Stratospheric Observatory for InfraredAstronomy (SOFIA) to determine the composition of exozodiacal dust inextrasolar protoplanetary disks. Before that can be done, however, scientistsmust first determine if detection of particular minerals in these distant systemsis even possible. This study helps scientists determine what signatures to lookfor in disks. The composition of the dust is identified by studying itsemission features. A common procedure is to use infrared spectroscopy toidentify substances by the infrared wavelengths they absorb or emit. Thisprocedure is often used to detect water on planetary bodies. Morris and her colleagues began by modeling the infraredemission features of dust that did not contain hydrated minerals, orphyllosilicates. They then changed the mineral mixture by addingphyllosilicates amounting to three percent of the total mixture. In the paper, Morris and her co-author Steve Desch ofArizona State University claim that unique features indicative of phyllosilicatesin the mid-infrared spectra should make it possible to detect those minerals inprotoplanetary disks. Scott Sandford, a research astrophysicist at the NASA AmesResearch Center in California who has experience conducting spectroscopy inmeteorites, disagrees. He says proving the presence of phyllosilicates in aprotoplanetary disk is a challenge. "It is somewhat difficult to identify phyllosilicateswhen they are present in mixtures because they are relatively featureless asopposed to other minerals, which have a lot of structural features in theirspectrum," says Sandford. Morris says the outcome of this study shows only that, basedon the computer models, it should be possible to detect the presence ofphyllosilicates in protoplanetary disks. It is only the first step in the detectionof water in other solar systems. "My part was developing the model to determine whetherit could be done," says Morris. "What instruments are available? Of theinstruments we have, do they have the resolution?" The next step, which Morris has already begun, is to applythis technique to actual data. Morris is now comparing the models to dataobtained from the Spitzer Space Telescope. Sandford says that will be the real test. "The basic idea they are espousing is a perfectly goodone," says Sandford. "I'm personally kind of skeptical that you canlocate the phyllosilicates in this disk to the level they suggest. How applicableare those models to the real world?" Morris says this type of research is also important inunderstanding how planetary systems form in general. "I'm a huge advocate for looking for water in our ownsolar system," says Morris, "but just to understand the process ofplanetary system formation, we need to go outsideour solar system and look at other systems as well."